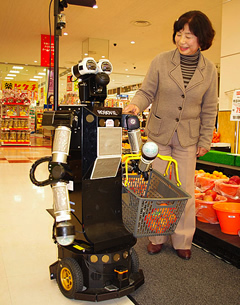 Robovie is a robot shopping assistant currently being testing in Japan. At home, shoppers build a shopping list on a mobile device, and once at the grocery store, the robot detects the mobile device and follows them around with a shopping basket, reminding them what's on their list and even making suggestions along the way. Also, it makes witty banter. Wow. Only in Japan. How curious their fascination with robots is to me. The quote of the 67 woman, "It's like being around the big shops with grandchildren...," made me wonder wouldn't it be better to be with her grandkids than the robot?